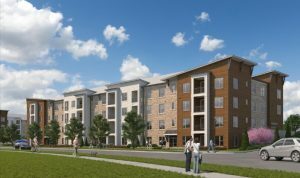 Charlotte developer Crescent Communities has begun construction on yet another multifamily project in the Queen City. Novel Research Park, at the intersection of West Mallard Creek Church Road and Senator Royall Drive in University, will include 280- units with one, two and three bedroom apartments. According to the developer, Crescent rezoned the 37.5 acre property in early 2017 to develop apartments as well as retail space and a 200-room hotel.